Do you think this post meets the rules of engagement? As a teenager, I read every book on Atlantis; So let us have some fun in the Search for 'Atlantis". Satellite Discoveries is Marsproof's site. She's a member here, but very sporadic. Quote: Satellite Discoveries is Marsproof's site. There seem to any number of sites folks believe to be the location of Atlantis, and just maybe there is a single city location that at one time bore the name Atlantis. But just maybe it goes far, far beyond that. If there was once such a place on earth known as Atlantis, a wonderful shining culture of highly advanced technology, would not most of the cultures around the world have sought to adopt, even surpass that culture. Human nature could not have changed so much over the eons... really! Just as the advanced nations of today seek to compete for notice and bragging rites to the most advanced cities with the tallest, grandest buildings and cultural riches as in the case of New York, London, Paris, and the newly emerging cities in the far East, so might the world have spawned many "Atlantis" type societies. A truly one world culture arisen from a possible single source? Why is it that Atlantis had to have been on Earth? My thought is that some of what we interpret from ancient text could have been on Mars or elsewhere. If you are one to believe that we didn't originate from here (or at least our creator(s) didn't) then it would stand to reason that some of the tales passed down to us are in reality tales from ancient elsewhere's. Personally, I believe in the possibility that the Garden of Eden and Atlantis did not originate on Earth. The fact that our ancient ancestors saw fit to mimic landmarks and surrounding of things familiar to them tells me that just because a landscape is described doesn't mean its being described in the place/planet the text is found. 1000 years ago everybody knew that earth was the center of the universe. 500 years ago, they knew it was flat. 15 minutes ago, you knew we humans were alone on it. Imagine what you'll know tomorrow. I know there are those who believe we came from elsewhere, say Mars or a transplant from some other alien culture, and knowing there is no difinitive proof one way or another, I acknowledge the reasons some believe so. However, If there are indeed artifacts on the Moon, it would lead me to believe a previous culture followed a simular agenda that we seek in our own generation. Namely, a moon base as a jumping-off /staging area for inner Solar system colonization from Earth. Such a base would hardly be of importance to those traveling here from elsewhere. On the face of it, it would seem the most logical conclusion, but perhaps not the only one. ANCIENT SAGA: The legend was that a warrior was born every 20 years to the clans of Mars. These people were the only warriors that existed on a planet of less than 200 million. As they neared their 20th birthdays, they would step down and the younger generation would take over. Although no one really knew why the warriors existed, they kept the legend alive. Approximately 10,000 years ago our time, the warriors were called upon to protect their planet. WASHINGTON (CNN) -- No one expects to lose much sleep over it but, for the record, NASA has been sued by three men from Yemen for invading Mars. The three say they own the red planet, and claim they have documents to prove it. "We inherited the planet from our ancestors 3,000 years ago," they told the weekly Arabic-language newspaper Al-Thawri, which published the report Thursday . That makes sense to me, absolutely. A jumping-off/staging area wouldn't need to be very large or lavish and if left unattended for a millenia would certainly be difficult to detect (leading to question of whether or not it even existed). a) We made a push outward at some point in the distant past. e) Our push outward to follow God came almost immediately after those beings left Earth. h) Some of those beings are still 'here' guiding our developement and/or are in collusion with 'us'. Date: Monday, 19 February 2007, 1:56 p.m.
1. Moonâs Age: The moon is far older than previously expected. Maybe even older than the Earth or the Sun. The oldest age for the Earth is estimated to be 4.6 billion years old; moon rocks were dated at 5.3 billion years old, and the dust upon which they were resting was at least another billion years older. 2. Rockâs Origin: The chemical composition of the dust upon which the rocks sat differed remarkably from the rocks themselves, contrary to accepted theories that the dust resulted from weathering and breakup of the rocks themselves. The rocks had to have come from somewhere else. "The abundance of refractory elements like titanium in the surface areas is so pronounced that several geologists proposed the refractory compounds were brought to the moonâs surface in great quantity in some unknown way. They donât know how, but that it was done cannot be questioned." 5. Magnetic Rocks: Moon rocks were magnetized. This is odd because there is no magnetic field on the moon itself. This could not have originated from a "close call" with Earthâsuch an encounter would have ripped the moon apart. 6. No Volcanoes: Some of the moonâs craters originated internally, yet there is no indication that the moon was ever hot enough to produce volcanic eruptions. "are broad, disk-shaped objects that could be possibly some kind of artificial construction. For huge circular disks are not likely to be beneath each huge maria, centered like bullâs-eyes in the middle of each, by coincidence or accident." 8. Seismic Activity: Hundreds of "moonquakes" are recorded each year that cannot be attributed to meteor strikes. In November, 1958, Soviet astronomer Nikolay A. Kozyrev of the Crimean Astrophysical Observatory photographed a gaseous eruption of the moon near the crater Alphonsus. He also detected a reddish glow that lasted for about an hour. In 1963, astronomers at the Lowell Observatory also saw reddish glows on the crests of ridges in the Aristarchus region. These observations have proved to be precisely identical and periodical, repeating themselves as the moon moves closer to the Earth. These are probably not natural phenomena. Nobel chemist Dr. Harold Urey suggested the moonâs reduced density is because of large areas inside the moon where is "simply a cavity." Greek authors Aristotle and Plutarch, and Roman authors Apolllonius Rhodius and Ovid all wrote of a group of people called the Proselenes who lived in the central mountainous area of Greece called Arcadia. The Proselenes claimed title to this area because their forebears were there "before there was a moon in the heavens." Very interesting post! Indeed, all of it! Quote: Greek authors Aristotle and Plutarch, and Roman authors Apolllonius Rhodius and Ovid all wrote of a group of people called the Proselenes who lived in the central mountainous area of Greece called Arcadia. The Proselenes claimed title to this area because their forebears were there "before there was a moon in the heavens." In example, your American Apollo astronauts were not the first to travel to the lunar surface. Utilizing solar and electromagnetic energy, Atlantis sent her lunar exploration vehicles there, many ages in the past. Physical evidence of same, there remains. Apollo 13 lunar exploration would have come close to an Atlantean geological research site, near the area known as Fra Mauru. Apollo 14 did so. Apollo 13 was not meant to complete its mission. The present-day Sons of Belial intended for the crew of Apollo 13 to die in space, which more than likely, would have resulted in the discontinuance of the American lunar exploration program. However, NASA did manage to return the crew back home to Earth and the program did continue. Apollo 14 was then assigned the Fra Mauru landing site and the mission progressed according to plan. However, photographs of the lunar surface taken by the lunar orbiter, as well as photographs taken by the astronauts who landed and walked upon the Fra Mauru site, have been censored and kept from the publics view. These photographs show that the astronauts did indeed find ancient remains of the Atlantean lunar research facility at that site. This consists of the remains of a domed, glass-like structure which housed the Atlantean researchers who conducted studies there ages ago. Here is concrete evidence not only of the existence of Atlantis in human history, but that their technology enabled them to travel to the moon ages before our American astronauts first set foot upon its surface. This information will come to light in the not-too-distant future. -W. T. Samsel and Tiagorrah of Poseidon. 11-21-1998. GOLD AND SILVER THE SACRED METALS OF ATLANTIS. MONEY is the instrumentality by which man is lifted above the limitations of barter. Baron Storch terms it "the marvellous instrument to which we are indebted for our wealth and civilization." Nails of copper and iron. It is evident that every primitive people uses as money those articles upon which they set the highest value--as cattle, jewels, slaves, salt, musket-balls, pins, snuff, whiskey, cotton shirts, leather, axes, and hammers; or those articles for which there was a foreign demand, and which they could trade off to the merchants for articles of necessity--as tea, silk, codfish, coonskins, cocoa-nuts, and tobacco. Then there is a later stage, when the stamp of the government is impressed upon paper, wood, pasteboard, or the bark of trees, and these articles are given a legal-tender character. more than the extraordinary value set upon gold and silver by the Spaniards; they could not understand it. A West Indian savage traded a handful of gold-dust with one of the sailors accompanying Columbus for some tool, and then ran for his life to the woods lest the sailor should repent his bargain and call him back. The Mexicans had coins of tin shaped like a letter T. We can understand this, for tin was necessary to them in hardening their bronze implements, and it may have been the highest type of metallic value among them. A round copper coin with a serpent stamped on it was found at Palenque, and T-shaped copper coins are very abundant in the ruins of Central America. This too we can understand, for copper was necessary in every work of art or utility. All these nations were familiar with gold and silver, but they used them as sacred metals for the adornment of the temples of the sun and moon. The color of gold was something of the color of the sun's rays, while the color of silver resembled the pale light of the moon, and hence they were respectively sacred to the gods of the sun and moon. And this is probably the origin of the comparative value of these metals: they became the precious metals because they were the sacred metals, and gold was more valuable than silver--just as the sun-god was the great god of the nations, while the mild moon was simply an attendant upon the sun. Toledo took, in 1577, $4,450,284 in gold and silver. ("New American CyclopÃ¦dia," art. American Antiquities.) The gold and silver of Peru largely contributed to form the metallic currency upon which Europe has carried on her commerce during the last three hundred years. Gold and silver were not valued in Peru for any intrinsic usefulness; they were regarded as sacred because reserved for the two great gods of the nation. As we find gold and silver mined and worked on both sides of the Atlantic at the earliest periods of recorded history, we may fairly conclude that they were known to the Atlanteans; and this view is confirmed by the statements of Plato, who represents a condition of things in Atlantis exactly like that which Pizarro found in Peru. Doubtless the vast accumulations of gold and silver in both countries were due to the fact that these metals were not permitted to be used by the people. In Peru the annual taxes of the people were paid to the Inca in part in gold and silver from the mines, and they were used to ornament the temples; and thus the work of accumulating the sacred metals went on from generation to generation. The same process doubtless led to the vast accumulations in the temples of Atlantis, as described by Plato. the Greeks, and the Romans designated gold was the Sanscrit word karat, which means, "the color of the sun." Among the Assyrians gold and silver were respectively consecrated to the and moon precisely as they were in Peru. A pyramid belonging to the palace of Nineveh is referred to repeatedly in the inscriptions. It was composed of seven stages, equal in height, and each one smaller in area than the one beneath it; each stage was covered with stucco of different colors, "a different color representing each of the heavenly bodies, the least important being at the base: white (Venus); black (Saturn); purple (Jupiter); blue (Mercury); vermillion (Mars); silver (the Moon); and gold (the Sun)." (Lenormant's "Ancient History of the East," vol. i., p. 463.) "In England, to this day the new moon is saluted with a bow or a courtesy, as well as the curious practice of 'turning one's silver,' which seems a relic of the offering of the moon's proper metal." (Tylor's "Anthropology", p. 361.) The custom of wishing, when one first sees the new moon, is probably a survival of moon-worship; the wish taking the place of the prayer. And thus has it come to pass that, precisely as the physicians of Europe, fifty years ago, practised bleeding, because for thousands of years their savage ancestors had used it to draw away the evil spirits out of the man, so the business of our modern civilization is dependent upon the superstition of a past civilization, and the bankers of the world are to-day perpetuating the adoration of "the tears wept by the sun" which was commenced ages since on the island of Atlantis. And it becomes a grave question--when we remember that the rapidly increasing business of the world, consequent upon an increasing population, and a civilization advancing with giant steps, is measured by the standard of a currency limited by natural laws, decreasing annually in production, and incapable of expanding proportionately to the growth of the world--whether this Atlantean superstition may not yet inflict more incalculable injuries on mankind than those which resulted from the practice of phlebotomy. Next: Chapter I: The Central American and Mexican Colonies. Your post concerning 'Atlantis on the Moon' contains references that I must guard against embracing too readily, even though I find it very easy to believe. Though I greatly wish to, some sense of false reserve restrains me from shouting "hurrah"! I have for many decades been convinced that a pre-flood culture (call it Atlantean or what you will) existed on a world wide scale that not only mastered flight, but went far beyond that and sought out the deepest secrets of our solar system and beyond, even attempting to colonize Mars, perhaps successfully, for centuries. Not content with that, they delved into the manipulation of science in a manner that would have brought natural creation to the verge of collapse, and were in turn visited with two great judgements that saw their ability to master advanced technology on a global scale curtailed for the next 6000 years. Ours is the generation that has finally seen the lifting of that restraint, and we seemed poised to repeat both the glories and abominations that lead to the destruction of that fabled culture so long ago. Would that we had the faith to understand the fine edge we stand balanced upon in our own day. We are become the mirrored image of that lost society. If you find more info along those same lines, please continue posting it. Enjoyed very much! I also believe there was a civilization previous to this one. The status quo types like to say, there is no evidence of a previous civilization. I say evidence is all over. They say, we don't find their pottery or firepits or etc. I point out that I don't throw broken pottery into my back yard and perhaps an advanced civilization might have the same standards of sanitation. My theory is that the sea level was lower as the ice age had more water locked in the interior. There were very few interior settlements due to the ice. The world got warmer. An ice sheet or two displaced and catastrophe resulted. Now we see evidence of drowned cities off the Bahamas, Cuba, Japan, India and who knows how many other places. The status quo types shrug those off and try to make them natural phenomena. One interesting bit of evidence for a previous world wide civilization is language. The Ainu in Japan and the Basque of Europe have related languages. They are not related genetically. Today, English is a sort of world language. It might not be everyone's first language, but it is sort of the de facto current world language. The Ainu and Basque languages have a similiar relationship in my mind. They have a common source lost in time. I often wonder what is being served by hiding this kind of information. Is it just academics protecting their points of view or is there a larger hidden purpose? Funny you should mention language. The English language at that! Communication is 'THE' foundation of our modern explosion of advanced technology. Genius plays a part, but not the major part. Check out your history books! A little over two hundred years ago the world had just barely five major technologies. Fire, guns, (and gunpowder) the sail, the wheel, and we had just learned how to put steam to work. Local areas had encremental technologies of various types but all revolved around those five majors. Then came the British empire who spread her language around the world while attempting to colonize most of it. You will see that the explosion of technologies are married directly with spreading of the English language and the development of the methods of communication (telegraph, telephone, radio, television, computer). An illustration I am fond of about how rapid the explosion of technology was in the middle of this period took place right here in our own country. In the middle of the 19th century there were children just old enough to sit at the dinner table and hear their fathers read first hand accounts about a major contingent of the US military being wiped out by a stone age group of people on the banks of the Little Big Horn river in Montana, Custers Last Stand, and just a very few of these children lived long enough to sit in front of their TVs and watch that same government place a man on the surface of the Moon! From warfare with sabers and flint tipped arrows to rocketships in a single human lifetime! There is no such astonishing advance in the affairs of humanity since the begining of recorded history. We've come a long way in two hundred years with the begining of a single human language to communicate with, where would we be, say a thousand years from now with such a tool? Carving mountains into faces on Mars? Quote: Carving mountains into faces on Mars? Maybe after the next worldwide disastercataclysmwar we will have more of a technological base left and won't have to do the amnesia thing as we start the climb all over again. A study of medieval Islamic art has shown some of its geometric patterns use principles established centuries later by modern mathematicians. Researchers in the US have found 15th Century examples that use the concept of quasicrystalline geometry. This indicates intuitive understanding of complex mathematical formulae, even if the artisans had not worked out the underlying theory, the study says. The discovery is published in the journal Science. The research shows an important breakthrough had occurred in Islamic mathematics and design by 1200. "It's absolutely stunning," Harvard's Peter Lu said in an interview. "They made tilings that reflect mathematics that were so sophisticated that we didn't figure it out until the last 20 or 30 years." 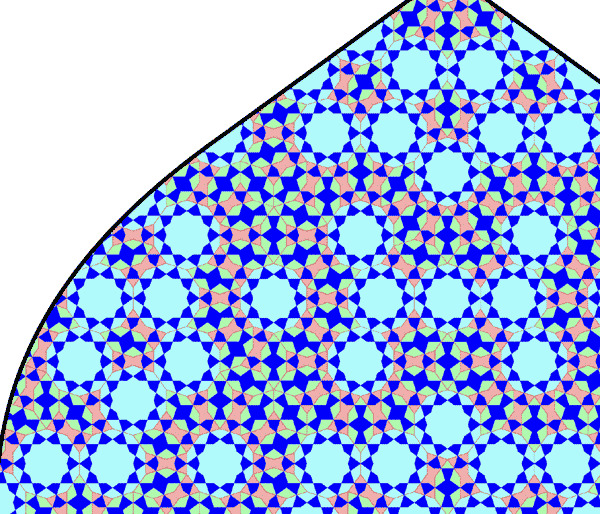 The Islamic designs echo quasicrystalline geometry in that both use symmetrical polygonal shapes to create patterns that can be extended indefinitely. Until now, the conventional view was that the complicated star-and-polygon patterns of Islamic design were conceived as zigzagging lines drafted using straightedge rulers and compasses. "You can go through and see the evolution of increasing geometric sophistication. So they start out with simple patterns, and they get more complex," Mr Lu added. He became interested in the subject while travelling in Uzbekistan, where he noticed a 16th Century Islamic building with decagonal motif tiling. Mr Lu, who designs physics experiments for the International Space Station, was in the region in order to visit a space facility in Turkmenistan. Islamic art traditionally uses a mixture of calligraphy, geometric and floral designs because of a prohibition on the portrayal of the human form. And Not One of Those " Stone Age People"
I wonder how many Afgans or Iraqis have military degrees? They fight on their own ground. The training they are getting "on the job" will stand in very well for many such degrees. found in the Human Psyche and not always in the "Book"
Zecharia Sitchin actually touched on this in his book The 12th Planet. He asserts that the Nephilem or Annunaki came to Earth and spliced their DNA with the indigenous people of that time (Neanderthal Man) creating the 'Adam', or first man, fashioned as a worker to mine the Earth for resources they needed. He also noted that the term 'worship' was originally meant 'to work for'. All this supposedly happened some 440,000 years ago. There seems to ongoing controversy about our connection/non-connection to the Neandertals. I lean toward a connection in ancient times that may turn out to be far stranger than most now guess. The next twenty years will almost certainly see the rebirth of a creature identical to the fossil record. Walking, breathing, and....talking. It is inevitable that science, learning that they can, will bring back the Neandertal/Humanzee. The financial incentive will be incalculable. The uses of such a creature incalculable as well.